A non-mutant's bullet grazed Scarlet Witch's skull in #49, causing Quicksilver to take her to rejoin Magneto. 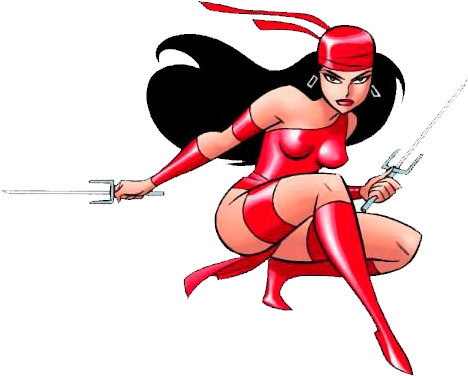 It was revealed in X-Men #43 that the bullet took away her hex power. In Avengers #53 Pietro and Wanda left Magneto and went off with Toad to seek a cure for the Witch. Vision first appeared after all this in #57. 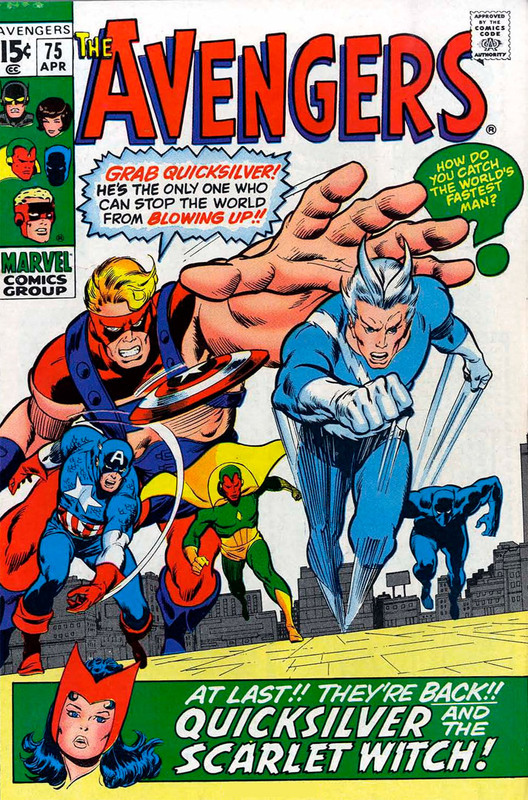 Quicksilver has been seen in Amazing Spider-Man #71 since then, where he tried to capture the then-fugitive Spider-Man, hoping to get back in the Avengers' good graces. Pietro arrives here with a new blue costume colour, replacing the original green. This will remain his signature colour. Arkon's world, which will later be named Polemachus, is one of those planets beloved of comics (and early Star Trek) where the whole population seems to exist in one small area. It has never been designated as an alternate Earth, with a number like the one in Annual #2. The Polemachans refer to their world as the universe. This may be hyperbole. But it may also mean that it is in another dimension, or at least a wildly different alternate universe, where Polemachus and its power ring are the only things that exist. John Buscema returned to the pencil chores last issue, along with a new inker Tom Palmer. And they're set to be the standard team for a while. This issue is just setup for the next one. The Avengers Index lists only Black Panther, Goliath and Vision as current Avengers this issue. Wasp and Yellowjacket are considered to have resigned before it starts. Captain America is only visiting. This temporary state of affairs isn't quite as bad as #51 with only Hawkeye, Wasp and a depowered Goliath (then Hank Pym). Hank Pym's Alaskan mission will involve him and Wasp with the Avengers again in #90-91. Bill Foster is a scientist that Tony Stark sent to help Hank in #32, and has been seen several times since. He will crop up next in Hank's Ant-Man series in Marvel Feature. And after that in Power Man #24 he will become Black Goliath, another user of Hank's growth serum, leading to his own short-run title. Quicksilver turns up at Avengers Mansion looking for his ex-teammates. Jarvis directs him to the harbour where they are saying goodbye to Wasp and Yellowjacket. Captain America is there too. Hank and Jan leave for Alaska with Bill Foster, on a scientific mission for the government. Pietro is here to ask for help, but as usual trigger-happy Goliath starts a fight before finding that out. Quicksilver is only stopped because he has never met Vision before, and doesn't know of his powers. Pietro explains how he, Scarlet Witch and Toad have tried to find a way to restore Wanda's hex power. Their search led them to a hidden book of magic. Wanda was drawn to intone a certain spell, which brought a barbarian warrior called Arkon into their world. Arkon told them that he is ruler of a planet occupying Earth's place in an alternate universe, a planet that glorifies war. It got its light from an orbiting energy ring, but that ring went dark. However the planet gained a reprieve when Earth's atomic bombs rent the veil between universes and provided a new temporary light source. Arkon's head scientist found a way to spy on Earth. He determined that a sufficiently large amount of atomic energy realeased on Earth, deadly to us, would give Arkon's planet enough light for ages to come. Arkon learned that a certain mystic spell would open the barrier from the Avengers' side, but only if spoken by a mutant. The scientist managed to send the magic book here, and Arkon guided Scarlet Witch to find it. He chose Wanda because he had fallen in love with her while viewing us from afar. The warrior used 'lightning bolts' from his quiver to send Toad and the Witch back to his homeworld, and another to transport himself away. Then Pietro came to the Avengers for help. As Quicksilver finishes his tale, a news report announces that Arkon has appeared at a scientific conference, and used his lightning bolts to spirit some scientists away. Plus: Arkon, Goliath (Clint Barton), Jarvis (Edwin Jarvis), Toad.